Secrets of our FIt Chick Belly Blast Winner! Our Texas Fit Chick Cecilia had amazing results with bootcamp and our Belly Blast Challenge! She had weight loss of 10.37% and experienced a total transformation! This is her before and after. So many of our Texas FIt Chicks took the challenge and got great results! 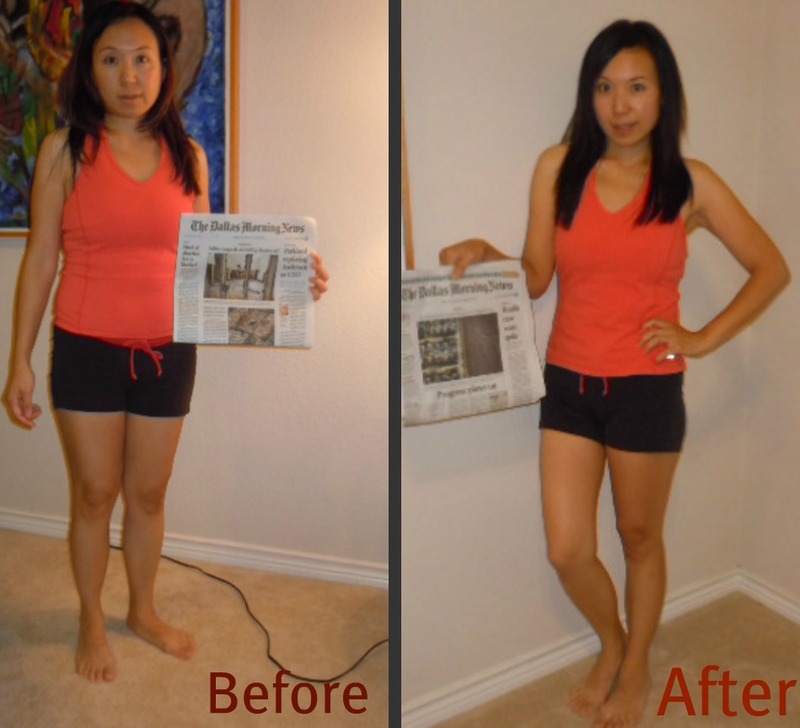 Cecilia was gracious enough to send me her 'secrets' of success and exactly what she did to get these great results! On my cheat days, I picked one thing that I liked the most to eat for lunch so I still had time to digest before going to bed. Since my favorite was sushi, I had sushi for my cheat days. When I ate my cheat food, I ate fist size portion (I imagine my stomach is like the size of my fist. I sure don't want to overstuff myself). If I had to eat after 6pm, I ate veggies only withno dip or dressing. I think the top 3 things that I learned from this contest are goals setting, meal planning and enjoying the process. It is important to set your goal so that you can stay focused. And more importantly, you have to think ahead and plan ahead of time of what you need to eat on the next day. I made my food ahead of time so that I could bring it to work everyday. I have saved so much money by not eating out, it is just amazing to see how much more food I can get, and how much money I can save by eating at home. I love the Texas Fit chicks Bootcamp because I need direction when it comes down to working out. I need feedback and I need to know what I am doing is benefiting to what part of my body. In addition to that, I also love to see familiar faces at the bootcamp. I feel comfortable working out with a bunch of ladies who are just like me. We are non judgemental and totally care free. Working out with the Fit chicks bootcamp is like my special break away from my busy work and family. Our one hour of bootcamp passes by so quickly especially with Michelle and us joking around and chit chating. I am now actually looking forward to working out since I love the fun atmosphere and the peaceful mornings spent working out!" Are you ready to lose weight and transform your body? Check out our Belly Blast and consider taking the challenge ~ it works! 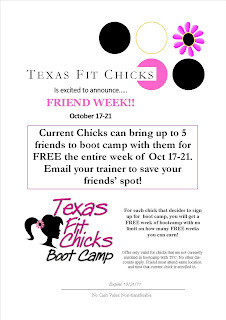 Next week is FRIEND week at Texas FIt Chicks Bootcamp! !